Freya’s Florence is no longer only about Freya; it has grown to now include an excellent international and local team of likeminded professionals dedicated to the same principles which have been present since the beginning: the desire to open the city to visitors through the art, history, food, fashion and architecture, bringing the past as much to life as the present. Our goal is to open a doorway to allow you to experience the history and get to know the characters, rather than simply seeing the sights and remaining on the outside. The carefully handpicked international team of Freya’s Florence all share the same characteristics which are the foundation of Freya’s reputation: enthusiasm, a vast knowledge of art and history, a knack for communication, a sense of fun and a love for Florence and Italy and life in general. The goal is to be the best private tour team in Florence and to collaborate with only the best outside of the city, in the countryside and other cities. All guides in the cities have the required licence issued by the government necessary in order to conduct historical, artistic and cultural tours. Australian born, Eurocentric and Italian focused, Freya wears her newly acquired Italian citizenship like one of her many much loved red jackets – with flair, passion and pride. She loves art, a good story, being surrounded by beauty, and feeds on feelings, excitement and great ideas. Florence has been her home since 2000 and being a private tour guide is her vocation. Her degrees, both undergraduate (Sydney University) and Masters (Warwick university, England), in art history provided the starting block for a lifelong love affair with beauty and the understanding that the picture really does speak a thousand words. Scholarships at the beginning provided the possibility for full Euro immersion (Rotary Youth Exchange program to Belgium, to France at the Sorbonne University, to Italy on post-graduate research scholarship), and a thirst for adventure made her stay. She tries to touch an Aussie beach once a year for a few weeks but is tickled pink to be living her life in the country of melodrama, Italy. Constant reading, limitless curiosity and continuing attendance at independent courses make her realise that there are never enough days in the year to discover all the many fabulous things in Florence and in Italy in general, and she is always dreaming up the next exciting project for Freya’s Florence Tours. Freya’s Florence Tours have been recommended in the Lonely Planet guides for the past four years (Italy book, Florence & Tuscany book, Florence city guide). 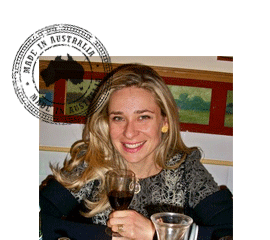 Freya appeared in the Florence episode of Australian Masterchief as a food guide to the celebrity chef and contestants during their huge Italy extravaganza in 2012. She was an advisor on the content for the episode in the planning stages. Freya writes regularly for ITALIA! magazine, a monthly publication in English distributed internationally. She writes articles, the one page feature Fast Culture series and the Fast Fashion series. You can book any of the Classic or Specialised tours, or book a half or full day tour stating any particular requests that you may have and we will design a tour for you.